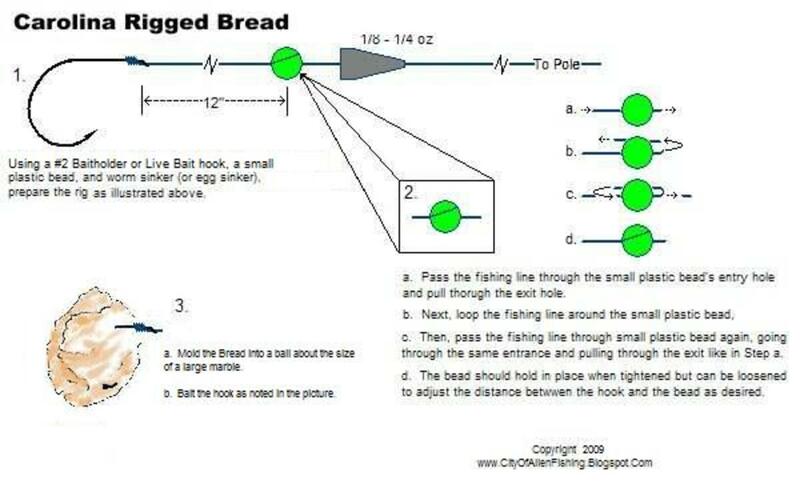 Expanding on our HubPages article, "Fishing With Bread", here is a follow-on article that describes two fishing rigs I use when fishing with bread and how I bait them by molding the bread around the hook. 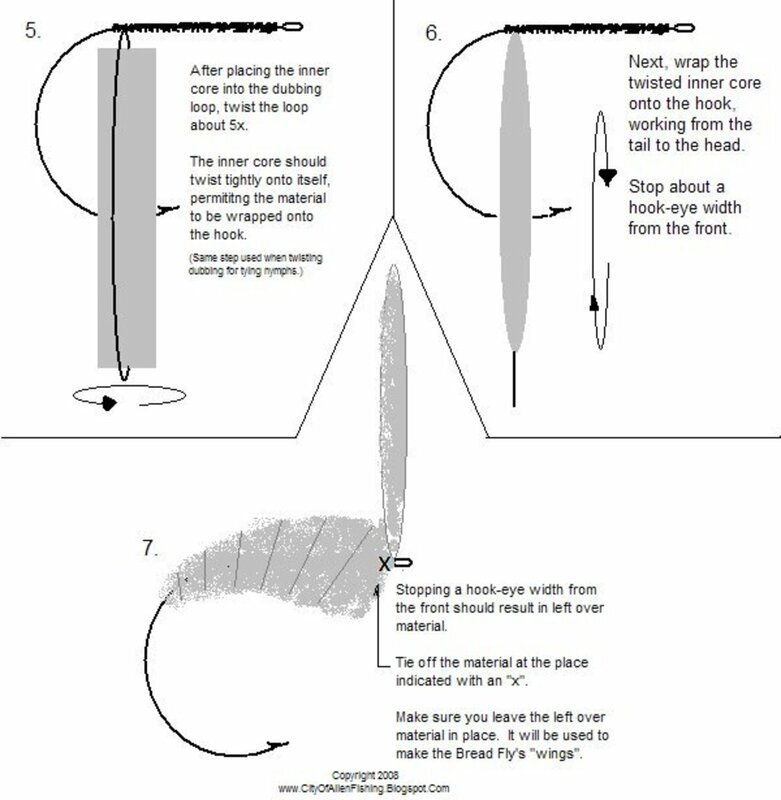 Also, I have included illustrations on how I tie the "Bread Fly", a fishing fly I use to simulate a floating piece of bread. Works well once an area has been chummed with pieces of bread. 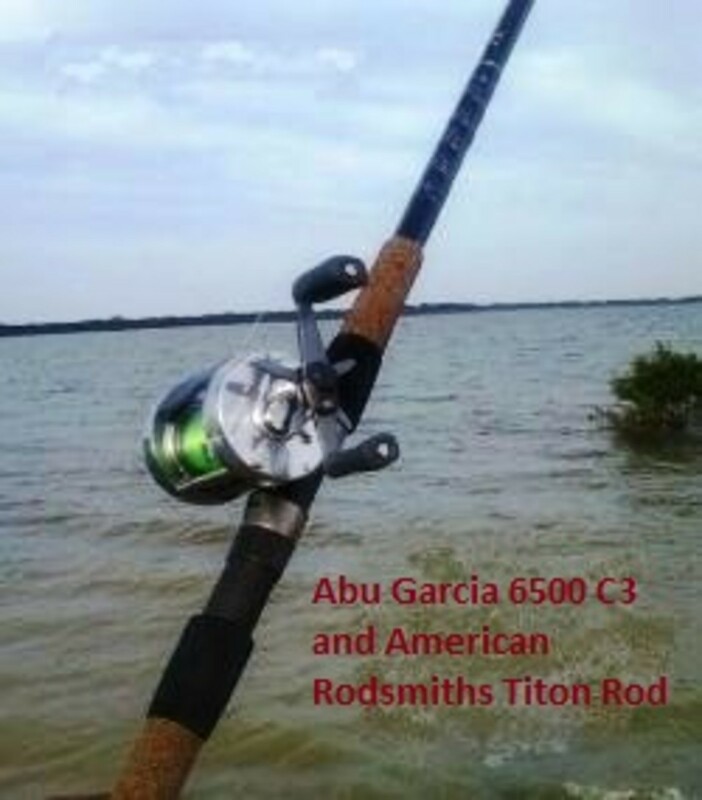 I use this rig because it is simple and consistently produces hook-ups when fishing ponds that see heavy fishing pressure. The fish are finicky and drop the bait at the slightest hint of drag. By freelining, the fish are able to nibble and pick at the bait much like they do when eating the bread fed to ducks and geese. 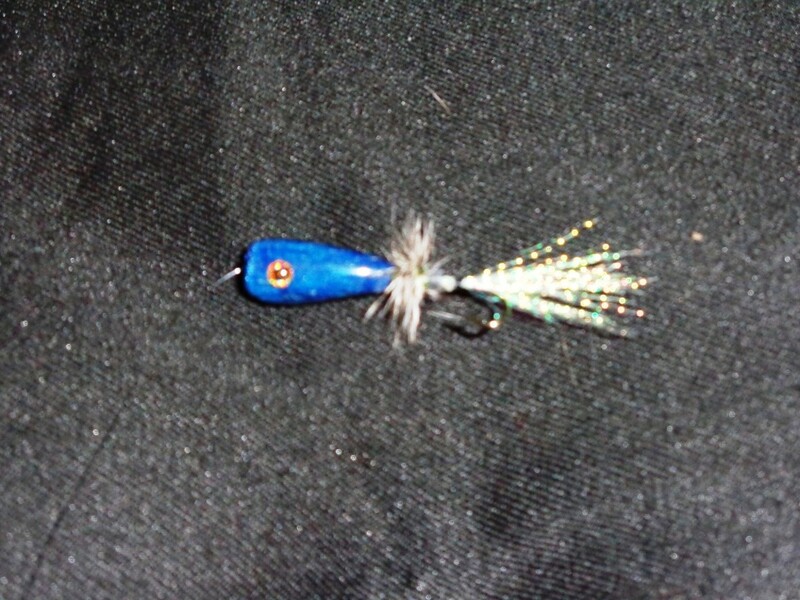 As the fish mouths the bread, keep the slack out of your line but do not apply line pressure. More important, don't set the hook as of yet; allow the fish to take the bait giving line as needed. Depending on how hungry and aggressive the fish may be, set the hook a few seconds after the initial pick up or wait a few minutes to allow the fish to take the bait. Also, be prepared to adjust timing the hook set as it will vary each outing. 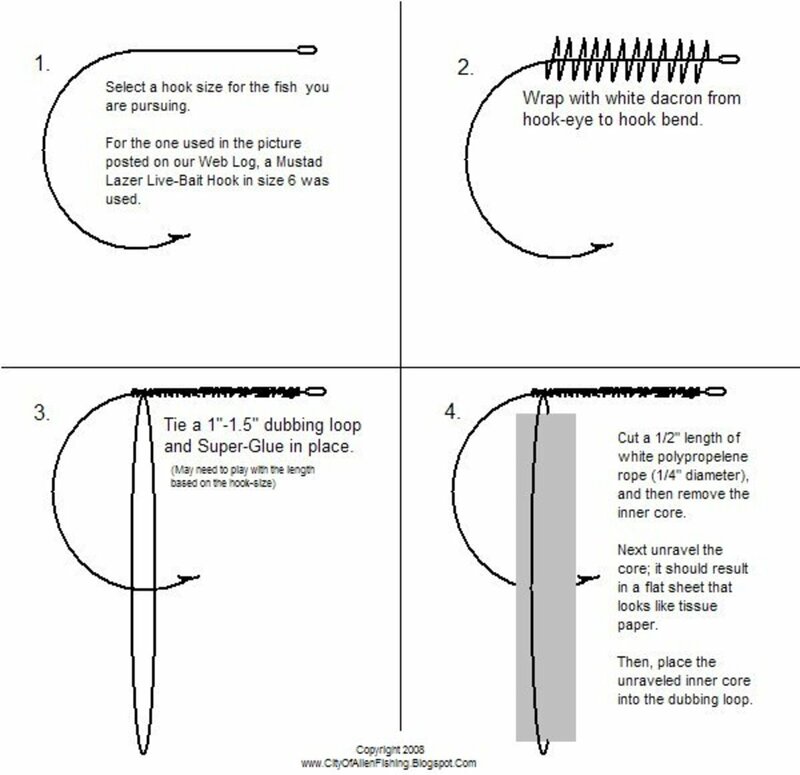 When setting the hook, quickly reel in the remaining slack to tighten the line and maintain steady pressure on the fish. No need to pull back and set the hook hard like the big game fishermen do on television. As a general rule, I usually wait till the line is moving at a steady pace before setting the hook. 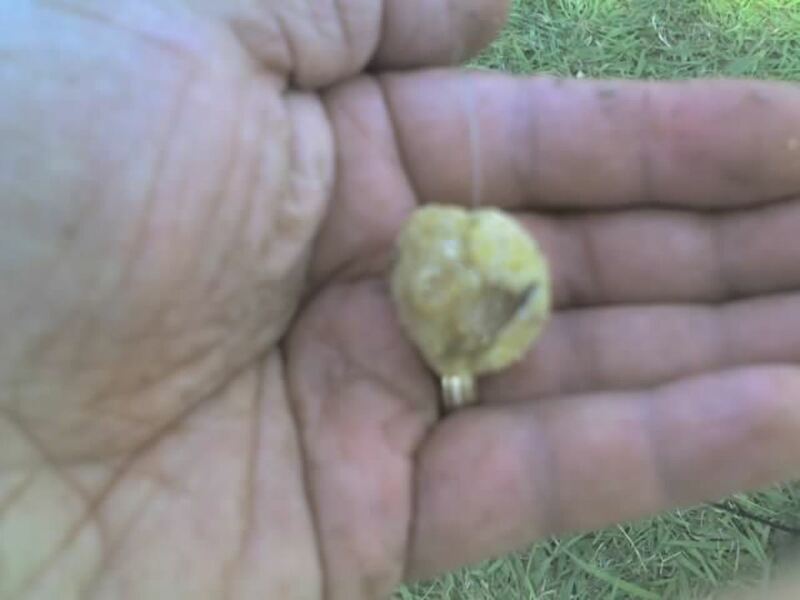 Doing so either results in a solid hook up with a nice Bruiser Catfish or a lost bait that was most likely taken by one of the small Bullheads. Once the hook is set, fight the fish and work it to shore. If it is a Bruiser, make sure you have a net to land it. Else, do your best to land it! 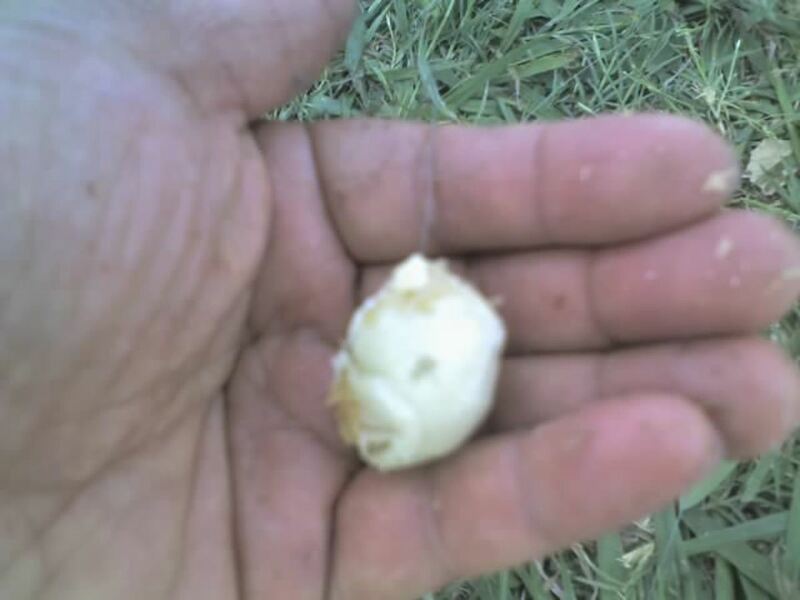 PS: Do check out the video in the sidebar on how we use cheese cloth when using bread as bait. Works really well on a circle hook! 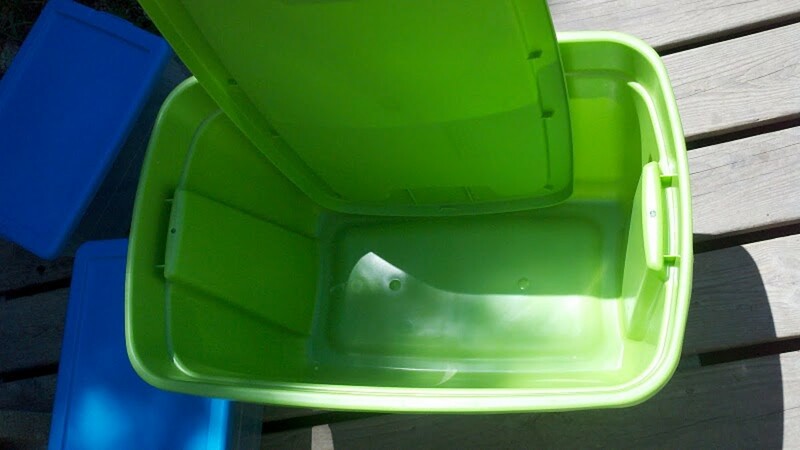 I use this fishing rig to fish the bread on the bottom. 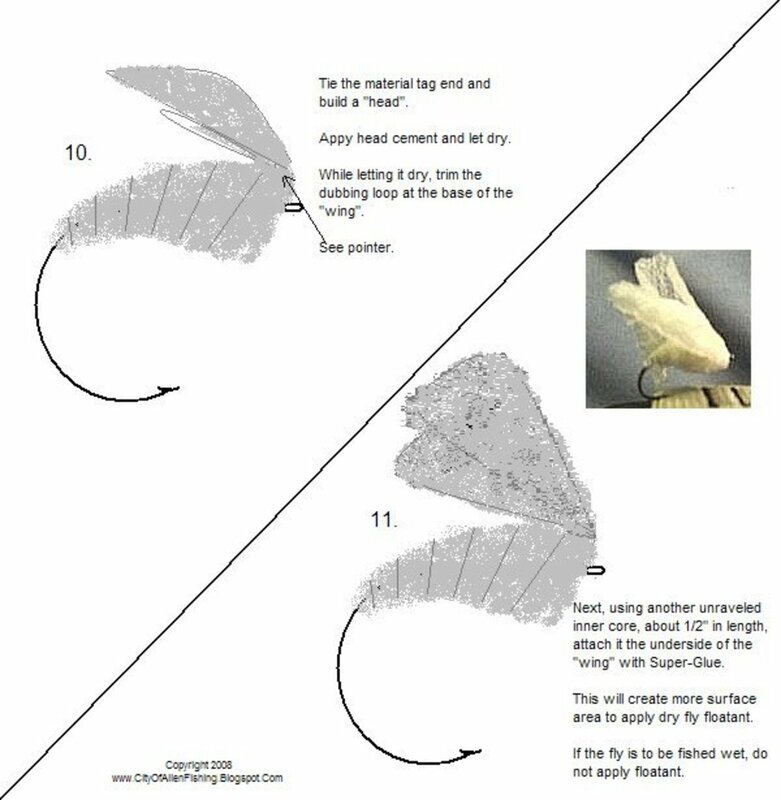 The weight allows for easier casting and uses a slip-sinker that minimizes drag once the fish begins to nibble on the bread. The fishing rig produces fish but not near the same size and quality compared to freelining bread. Others have noted otherwise but for the local area where I fish freelining is the rig of choice. Not certain why this is the case other than freelining produces the least amount of drag when fishing with bread. 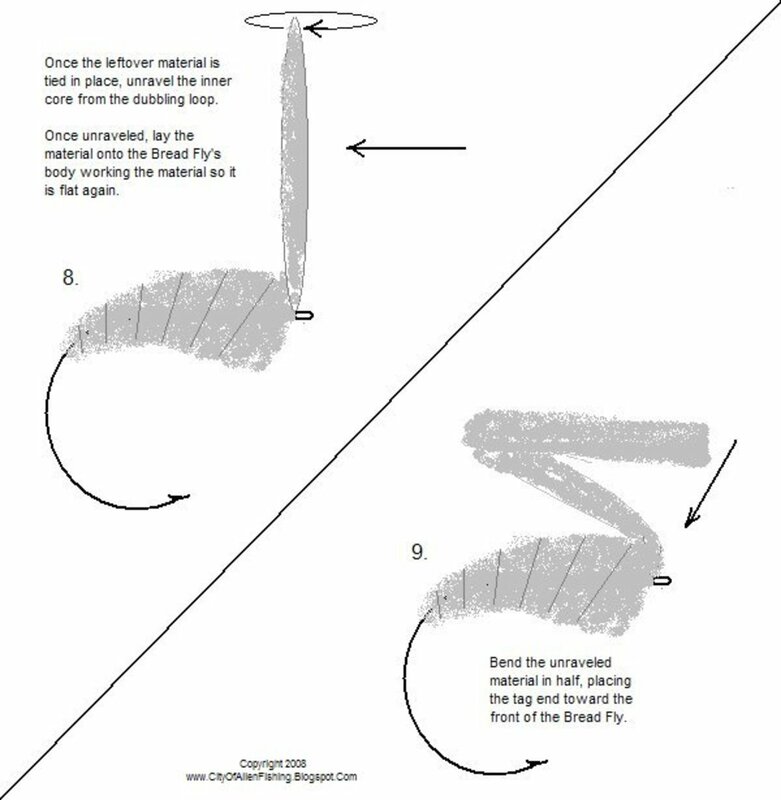 For the fly-fishing enthusiast, here are illustrations on how to tie a "Bread Fly". I use this method as a change of pace to fishing with bait. It will catch Catfish, Bluegill, and Sunfish when fished "as is" but works better when the area is chummed with bread first. Check it out, tie one if you like, and tell us what you caught! Started out catching them with a Tube Damsel Fly, then switched to Bread for Bait. Caught a few nice ones... did mis-count the number caught... was not nine Catfish, think it was eight. No matter; had a fun time using what we had - a fly rod and freelining bread. Went back the next day... sure enough bread still works! Simple free-lined rig with no weight. Caught 17 Catfish using bread for bait that morning. All were caught and released. 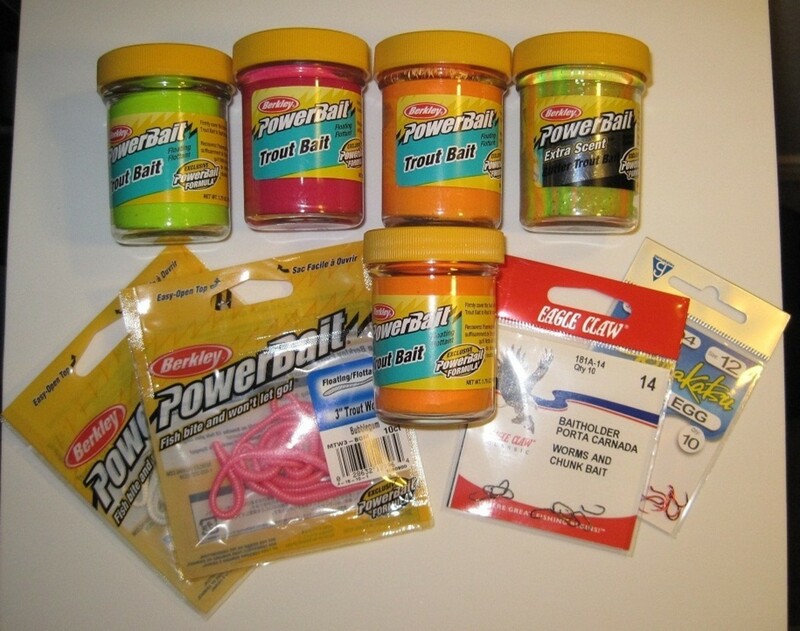 Does bread for bait work for fishing in your area? Do let us know if these rigs work for you! And, do comment in the section below. They will work if you could spare a couple dollars for them. Wal-Mart should have them in store too. I know it worked for the kids. 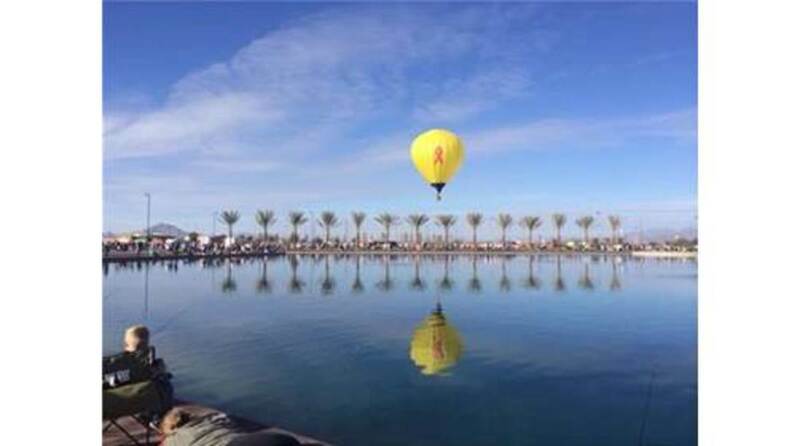 Bells were ringing all over the pond. 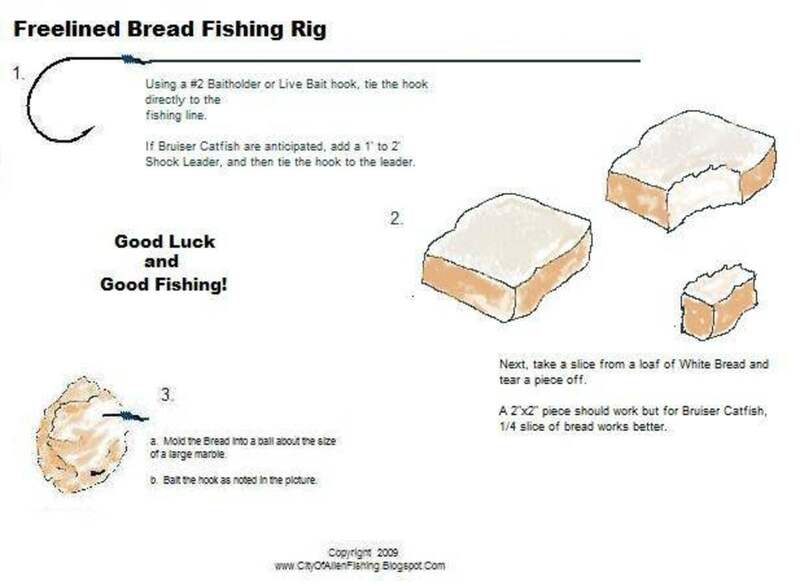 Added a video in the Freelining Bread section that shows how we use cheese cloth to fish with bread as bait. Works well with a Circle Hook!